The convention organizers want to extend our gratitude to all of our amazingly generous Convention Sponsors who helped us out of serious debt. 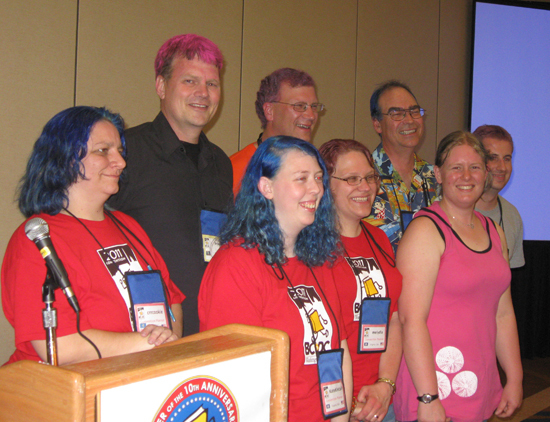 Thank you to everyone who registered for the convention, purchased extra Bally Bucks or apparel, participated in the hair dyeing fundraiser, or donated any amount. You can still donate on the How to Help page. I’ve put out the word to my colleagues at my office, and have already heard at least one person promising a donation. I expect that my co-workers are going to love a chance to make me look silly! If he still has a problem with that then I gusses Lime Green is better nothing. Hey, listen here! This ain’t no dolly you’re dyeing! This is the beloved hair of a middle aged grumbleman who has individually named each thinning strand. Pink, green, fuschia – or Heaven forbid, a combination – this is my worst nightmare! My grace and dignity is important to me, and if I am tied down and my hair forcibly coloured, as seems increasingly likely from the numbers above, there will be NO SMILES. I shall grump and scowl my way through the convention. My hair may be festive, but that’s it. Thanks Discoverylover I think I will take you up on the offer if Pete stops my Tim Tams. 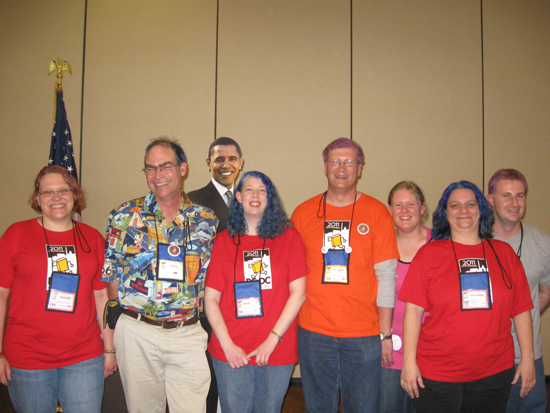 So it seems that k-j-h and I will both have purple hair at the convention. I’m thinking that a nice shade of lavender would look nice (and clash oh so well with the red shirt). You’ll have to attend the convention (or be content with pictures) and you won’t know until April 15th exactly how I will look! PurplyPup no problem at all!! funds are tightm but I am mailing a small donation and I support PINK FOR KATE! With the meter a few points shy of 75%, looks like I’m off the hook. A huge relief for me. Sorry that the organisers are going to be well out of pocket, but I can keep my hair its natural colour, and get to chuckle at the handful of goofballs with weird hair. Perfect outcome! I’ve put some money on pink for Pete! We can do it!! so Pete can have colored hair! We’re almost at 75% and currently just $3 separates the colors blue & purple. But pink is rapidly gaining ground. Whatever color is in the lead when we hit 75% will be Skyring’s color! It could be anything. http://www.flickr.com/photos/19486062@N00/5573369164/ for the latest picture, although Pete’s blue hair is awfully hard to see!! Oh, I’m so bummed we didn’t get pink for Pete! There’s still time to donate to make Pete’s SECOND color pink! why not try for any other color than Purple and Blue! I thought deadline was April 7? I tried to make another donation as I hate to see Melydia left out of the fun! Not to mention I do like to see Bruce in pink hair. The current total is almost 79%. So please get your friends/family/very generous strangers to donate today so melydia won’t feel left out and so the convention planning team won’t be stuck with a huge bill from the hotel.